With its endless blue lakes, countless islands and stretches of sandy beaches Muskoka Lakes is the perfect setting for a pleasurable escape. Its three big lakes – Joseph, Rosseau and Muskoka – and their several lakeside communities are a perennial playground for tourists, cottagers and residents. View photos of Muskoka and check the Muskoka weather. Port Carling is always buzzing with endless activities. 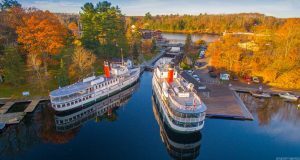 The town’s famous locks, linking Lakes Muskoka and Rosseau, produce a daily parade of motor boats as pleasure craft, construction barges and cruisers lock through. The town has a prominent position in Muskoka’s boat building history, and this heritage is proudly displayed at the Muskoka Lakes Museum. Bala, a lively tourist town boasting two spectacular falls, is located where Lake Muskoka spills into the Moon River. At the beach exciting water skiing competitions take place throughout the summer. There are numerous shops and stores for a pleasurable shopping experience. Milford Bay, Torrance, Port Sandfield and the Muskoka Lakes’ other communities offer special events and everyday activities all year long. Take the time to visit Muskoka and see for yourself. Plan to be a part of the Muskoka Lakes experience. While in Central Ontario, visit Santa’s Village, one of the best Ontario attractions featuring a family amusement park and Santa himself. Bracebridge is Santa’s summer home! Santa’s Village also offers corporate team building in Ontario. View a list of Muskoka accommodations including resorts, inns, hotels and motels.. Looking for Muskoka real estate? Visit the Township of Muskoka Lakes. For more information on traveling the world, check out Travel With Brian.